The Barapani project was the second hydroelectric project undertaken after independence in Assam. The first was the Umtru Hydel Project, lower down in the Khasi Hills. The project, completed in 1957, was financed by Canadian capital from the Colombo plan. A run-of-river project, the dam relied on the flow of the Umtru River to turn its turbines for producing electricity.2 Umtru Dam was not capable of producing consistent levels of power throughout the year, because the flow of the Umtru River varied seasonally. Since snow never falls in the Khasi Hills, the area’s rivers rely entirely on rainfall. During the rainy season months, from around April to October, the rivers run high with heavy rainfall. But during the dry season, with no rain to feed them, the rivers sink and slow considerably. Fifty years after its construction, the Umiam Dam still stands in its ravine high in the Khasi Hills. A series of additional stages to the project have added further generating stations downhill. Despite the increased generating capacity, the Umiam project has not been able to keep up with rising demand. At times of peak power demand, particularly in the summer months, the Meghalaya state electric utility must selectively cut power. These scheduled blackouts have become a fact of life in areas served by power from Umiam Dam. The project provided power to an under-served part of India, but it could not keep up with increased demand due to population and industrial growth. 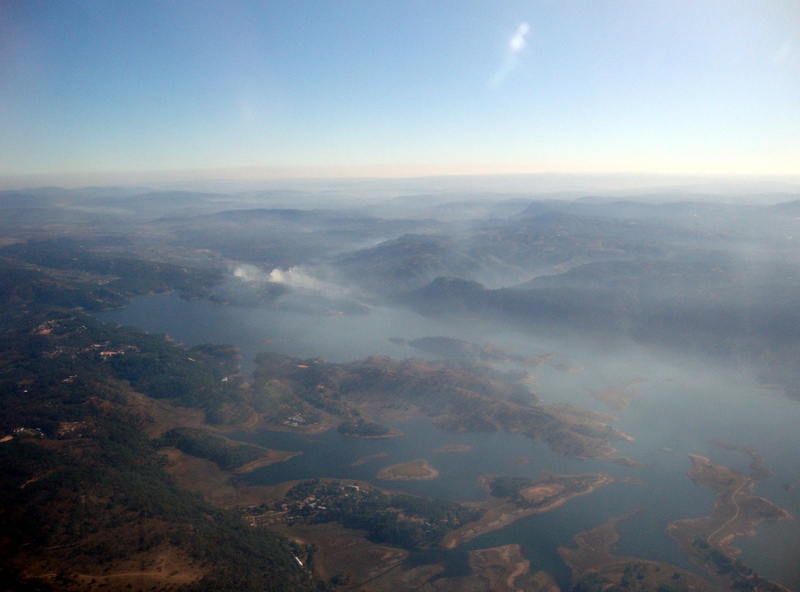 Aerial view of Umiam Reservoir in January 2010. The Aswan High Dam justifiably attracted international attention from the project’s inception in the 1950s. Nasser promoted the dam as a symbol of postcolonial Egypt’s entry into the modern age. The project was—and still is—famous as a major engineering work; modern technology had finally gained the ability to tame the ancient caprices of the Nile. The project also gained notoriety for displacing local populations by flooding their homelands, and for inundating ancient Egyptian cultural sites. UNESCO launched a publicized, and ultimately successful, attempt to cut apart and relocate the monument of Abu Simbel, but other unexplored cultural sites were lost under the Nile. By comparison, the Barapani or Umiam project received mostly local attention, as it was just one of scores of dam projects initiated during Nehru’s tenure as prime minister. The river Umiam was little-known outside of northeast India, and the project was comparatively small. Nevertheless, the Umiam project reveals much about its time period. The project brings together many recurring themes of the industrialization of India during the Nehru era. These include transfer of technological artifacts from highly-developed nations (in this case, the United States and Japan) to India; transfer of technological expertise to India; displacement of local populations by development projects imposed by societal elites; and the need for foreign funds to build the dam. Unlike Aswan High Dam, Umiam Dam was financed almost completely by American capital, in the form of PL-480 and DLF loans. (These were later consolidated under USAID – the United States Agency for International Development.) The Umiam project was one of the first Indian development projects financed to such a large degree by American capital. The Barapani Hydroelectric Project illustrates how development projects in Nehru’s India used foreign capital and equipment to create new Indian technologies.